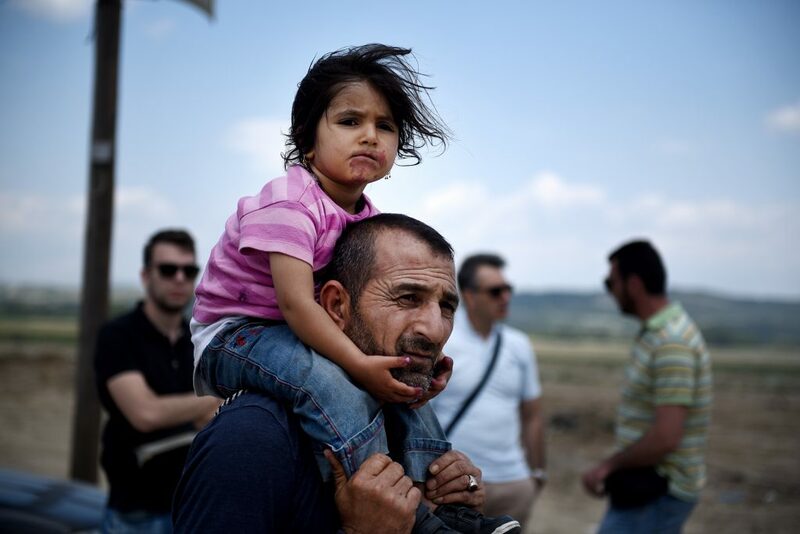 A Syrian man and his daughter at a refugee camp in Idomeni in northern Greece. In Greece, my native country, high unemployment and the ongoing financial crisis are combining with mass population movements of migrants and refugees to create huge development challenges for the country. Greece is also undergoing major demographic changes, with its ageing population reducing the number of young people entering the labour market and obliging those already in the workforce to work for longer and move between jobs more often. These facts point to an urgent need for a much stronger investment in lifelong learning, and particularly in adult education. By supporting adult education and adopting lifelong learning as the key educational paradigm for inclusive and sustainable learning societies, nation states can build populations that are resilient, adaptable, creative and highly skilled. Yet, in far too many cases, lifelong learning and adult education continue to be neglected. A recent report from the Organisation for Economic Cooperation and Development (OECD), Getting skills right: Future-ready adult learning systems, shows that Greece’s adult learning system performs poorly across several dimensions of the Priorities of Adult Learning (PAL) dashboard. The PAL dashboard indicates that my country has the weakest overall performance in terms of coverage of job-related adult learning. In addition, according to Eurostat, only a few adults re-skill through adult education courses in Greece. In 2017, less than 5 per cent of 25 to 64 years olds participated in such courses. Where these courses are offered, often they are often under-resourced and ill-equipped to address the challenges faced by these students. These figures are worrying, particularly when the need for lifelong learning is growing. Adult education has a key role to play in tackling current and future skill challenges, as well as in supporting personal development and social cohesion. It is essential not only in developing and improving skills to find a job, but also in helping people learn to live together. It supports the development of competencies needed to be able to live with different cultures and mentalities, to understand and respect them, to prevent conflict and extremism, to promote peace and to cope with the transformations with which we are all are faced. This wide potential contribution, captured eloquently in the third Global Report on Adult Learning and Education (GRALE 3), places adult education at the heart of the 2030 Agenda for Sustainable Development, which calls on all countries to ‘ensure inclusive and equitable quality education and promote lifelong learning opportunities for all’. As the next GRALE, due later this year, will show, we remain some way off achieving this ambitious target. Nevertheless, there are some green shoots, visible in Greece and elsewhere. One of the initiatives that contributes most strongly to the promotion of lifelong learning worldwide is the UNESCO Global Network of Learning Cities (GNLC). The UNESCO GNLC supports and improves the practice of lifelong learning by offering relevant programmes, forging links, fostering partnerships and providing capacity development. Some Greek cities are already members of this network. The city of Heraklion, for example, is among the winners of the 2019 Learning City Award. Through its ‘Fit for All’ programme, Heraklion has found an innovative and fun way to welcome refugees and help them integrate as quickly as possible into local society. The Greek city of Larissa was winner of the award in 2017, in recognition of its efforts to promote inclusion and engagement among its citizens. Heraklion, Larissa and other Greek city members of the GNLC should share their good practices and draw lessons from each other. If these projects become visible, other Greek cities and stakeholders will be encouraged to become active in promoting lifelong learning and realizing its wide benefits, across a range of agendas. This will have a positive effect in supporting the future development of the country. It will also be a constructive contribution to the achievement of the 2030 Agenda and its 17 stretching targets. Last, but not least, the launch of additional Greek learning cities will, hopefully, raise awareness among all relevant stakeholders that investment in adult education in the framework of lifelong learning is worthwhile, and that the benefits substantially outweigh the costs. As we prepare for the publication of GRALE 4 and for the next International Conference on Adult Education (CONFINTEA VII) in 2022, this is the message we need to promote, not only in Greece, but in countries around the world. This entry was posted in Education 2030 and tagged 2030 Agenda for Sustainable Development, adult education, GRALE, Greece, learning cities, lifelong learning, OECD, Priorities of Adult Learning, SDG 4, Skills by Paul Stanistreet. Bookmark the permalink.